By the 1850s, the expansion of printing and distribution technologies provided writers with more readers and literary outlets than ever before, while the ever-changing political contexts occasioned by the revolutions of 1830 and 1848 brought about differing degrees of political, social, and literary censure and pressure. 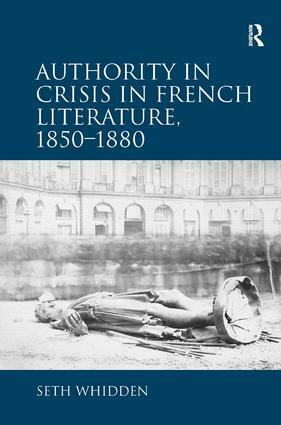 Seth Whidden examines crises of literary authority in nineteenth-century French literature, both in response to the attempts of the Second Empire (1852-1870) to restore the unquestioned imperial authority that had been established by Napoleon I and in the aftermath of the bloody Paris Commune of 1871. In each of his chapters, Whidden offers a representative case study highlighting one of several phenomena-literary collaboration, parody, destabilized poetic form, the substitution of one poetic or narrative voice with that of the man-that enabled challenges to the traditional status of the writer and, by extension, the political authority that it reflected. Whidden focuses on the play Le Supplice d’une femme (1865); the Cercle Zutiste, a group of writers, musicians, and artists who met regularly in the fall of 1871, only months after the fall of the Second Empire; Arthur Rimbaud’s Commune-era poems; and Jules Verne’s 1851 ’Un voyage en ballon,’ later reprinted as ’Un drame dans les airs’ in 1874. Whidden concludes with a futuristic look at authority and auctority as it pertains to midcentury writers taking stock of the weakened authority still possible in a post-Second Empire France and envisioning what kind of auctority is still to come. Seth Whidden is Associate Professor of French at Villanova University, USA, an affiliated member of the LIRE research group of the CNRS (UMR 5611), and editor of Nineteenth-Century French Studies. His previous publications include Leaving Parnassus: The Lyric Subject in Verlaine and Rimbaud (2007) and the edited volumes La poésie jubilatoire: Rimbaud, Verlaine et l'Album zutique (2010) and Models of Collaboration in Nineteenth-Century French Literature: Several Authors, One Pen (2009).